Welcome to Volume 4, Issue 1 of the Australian Medical Student Journal. 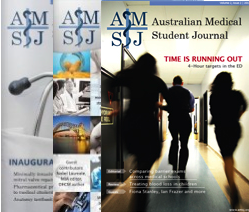 This issue of the AMSJ continues to develop our core aims of supporting medical student research by providing a dedicated journal for publication of outstanding medical student work and a focus on issues relevant to Australia in general and Australian medical students in particular. Key milestones for the Australian Medical Student Journal over the past months have included the online publication of the Australian Students’ Surgical Conference, the expansion of our editorial team to include seven new members, each talented upcoming physician-scientists, and a broader expansion of our medical student staff. Senior AMSJ staff are now located in every state across Australian and there are representatives at each medical school. This issue the AMSJ received an unprecedented number of outstanding submissions from medical students across the country. Some key highlights for this issue include a timely review by Boulat and Hatwal of the case for male HPV vaccination. This review, published as the Australian government announces its world first initiative of immunising young men against HPV, was identified by our editorial team and reviewers as a excellent review of an important contemporary public health issue and has been awarded the best article prize for Volume 4, Issue 1. Other notable submissions include a rigorous comparative review of anaesthetic methods for paediatric elective inguinal herniotomy, a synopsis of treatment options for preventing cardiac sequelae in Kawasaki disease, a reflective essay on the humanising influence of fiction in psychiatry, and a case report of spontaneous intracranial hypotension. Editorials by Saion Chatterjee and Janindu Goonawardena discuss structural changes occurring in academic publishing and the current challenges faced by the medical workforce across Australia. We are also privileged to host articles from prominent Australians: Professor Larkins, Chair of European Molecular Biology Laboratory-Australia (EMBL-Australia) and the Victorian Comprehensive Cancer Centre (VCCC), Professor Bolitho, President of the Royal Australia College of Physicians (RACP) and Professor Hollands, President of the Royal Australia College of Surgeons (RACS), to provide a top-down perspective on issues important to medical students. Health and medical research in Australia faces key challenges including sustainability and international competitiveness. The recent McKeon Review of Health and Medical Research in Australia provides a framework for how Australian researchers can help to maximise the health of all Australians and contribute on a global scale. A major facet of this review is the emphasis on collaboration. In a country with a population less than one fiftieth of our neighbours, China and India, and public research expenditure less than one thirtieth of the United States, collaboration is an integral component to achieving global impact. In his guest article, Professor Larkins, Chair of EMBL-Australia and the VCCC, offers his advice and experience as the Chair of two leading collaborative research initiatives in Australia. With the upcoming federal budget and election, we also spotlight the issue of sustainability in the healthcare system. Professor Bolitho of the RACP provides a considered perspective on the measures required to accommodate increasing numbers of medical graduates. Professor Hollands of the RACS and Associate Editor Janindu Goonawardena provide complementary perspectives on contemporary surgical training in Australia and discuss potential measures to address rural medical workforce shortages. This issue of AMSJ represents the accumulation of many hours of voluntary work from AMSJ staff and reviewers. We have been privileged to lead a team of highly motivated, intelligent and hardworking medical students from across the country, without whom publication of this journal would not be possible. We would additionally like to thank our external peer reviewers, many who completed their first review this issue and many more who regularly contribute their time and expertise to the AMSJ. The initiative of publicly thanking reviewers will be continued this year, and their names published in the latter half of the year. Finally, we would like to thank all authors who contributed to the AMSJ and all our readers, who provide content and meaning to this publication. We hope you enjoy this issue and that it serves as motivation for medical students and nascent authors of future publications.